Peter Lamprey writes that his aircraft was shot at by friendly anti-aircraft gunners but otherwise life was good. He mentions social life and concludes with some banter. What in hell you people expect me to write about, I don’t know. Nothing ever happens to me – I hope. This thing called life just keeps on and on. All I see before me is an endless vista of going up and coming down, or at least that is the general idea at present. If anyone wants to alter it they can have my resignation immediately or sooner. who proceeded to try and knock 8- out of us. Decent guys. We had the old kite going like a Mark IX Spitty [sic] as soon as the first one burst and if we had only had another pint in the tanks would have made Canada in about ten minutes. Its [sic] a great life – thats [sic] why half the perishers are trying to take it from us. I can see us having an unfortunate accident one night and unloading some urea on a certain gun site and see how they like being at the receiving end. found themselves in town the other evening. We must have take [sic] the wrong road somewhere. Anyway the town should recover in about a fortnight if it has plenty of rest. The cream is that the C.O. has been speaking of squashing the stand-by as we have been so good – we haven’t it’s just we were broke. If he finds out about the last do he’ll have baby. Still, we want a mascot for the flight. bit of the war for me when the weather clears I have no objection to this outside assistance. I am – strange how one’s character alters – glad to hear Charlie is doing well at his job. The sooner he gets through his course the sooner will he see these lovely foreign countries. If the rest of the mob are doing as well for themselves there should be quite a nice little farewell party pretty soon. As this letter is just a weeny bit overdue I think I’ll wrap up. Remember me to the rest of the herbs. 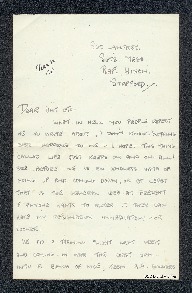 Peter Lamprey, “Letter from Peter Lamprey to W Gunton,” IBCC Digital Archive, accessed April 24, 2019, https://ibccdigitalarchive.lincoln.ac.uk/omeka/collections/document/6613.